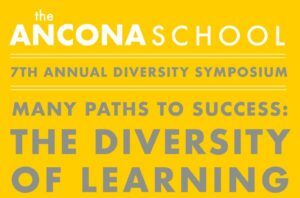 The O-School is excited to share we will be co-sponsoring Ancona School’s 7th Annual Diversity Symposium on Saturday, March 2. The event entitled, “Many Paths to Success: The Diversity of Learning,” will be held from 8:30 am to 3:00 pm at the Ancona School in the Kenwood neighborhood, just north of Hyde Park. The event is designed to bring education leaders and other special education professionals together to examine the diversity of learning. Experts in education and clinicians will lead sessions on a variety of topics focused on ensuring success for all learners, both in and out of the classroom. The O-School’s own Pete Myers, Psy.D., Co-Executive Director, and Kristin Friesen, LCSW, Director of Admissions, will also present during the daylong event. A special track for students ages 3-10 years old will allow young learners to engage with the theme of the diversity of learning through art, dance, story time, and social skills practice. Students over 10 years old are also invited to join the Symposium. If interested in attending, the fee for the Symposium is $25 for adults and free for students 18 and under. Registration includes morning refreshments and lunch. For more information about the Diversity Symposium click the event poster below or go here to register.